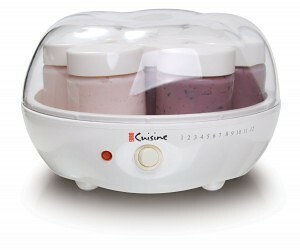 The Euro Cuisine YM80 Yogurt Maker provides an easy and convenient way to make delicious, fresh, creamy yogurt at home. Providing an affordable method of preparing delicious, wholesome homemade yogurt. Preparation time for the YM80 is a pretty standard 6 to 10 hours, depending on the thickness desired. It can make up to 42 ounces of yogurt. Using this item, the user can control how much sugar is in the yogurt, content of fat, additional flavorings and ingredients and how thick the yogurt is. A timer on the side of the unit marks the time when the yogurt is finished. This yogurt maker weighs 6 pounds, measures 5 ¾ inches high and 9 ½ inches in diameter and comes with 7 6 oz glass jars. With these jars, the user can make up to 7 different types of yogurts at the same time, which is an excellent feature. It also has a clear lid which is BPA free and from which the cooking process can be easily viewed. the Y80 has an on/off switch and light to indicate that it is working. A recipe book with a variety of yogurts as well as an instruction manual comes with this unit. The containers are made out of glass and are safe to wash in the dishwasher which saves a lot of the hassle people often have when making yogurt at home. The Euro Cuisine YM80 as as mentioned before does not come with an automatic off switch unlike it’s more advanced cousin, the Y100, so for a more advanced model you may look to one of these. The plastic lids are also susceptible of warping from heat coming from ovens or burners, so it is best to keep the unit far from these heat sources. The unit also does not come with a thermometer, which is necessary to keep track of the temperature when preparing yogurt. Thus the purchase of one will be necessary. It is an alternative way to get the benefits of milk for those who are lactose intolerant. studies have found that it helps to reduce high blood pressure, due to it’s potassium and calcium content. it is good for bone health. the probiotics that it contains help to strenghten the immune system. Their primary purpose though is to promote good bacteria in the gut as an overgrowth of bad bacteria can cause problems such as constipation, diarrhea and other intestinal maladies. The YM80 is a great product and in spite of the lack of a thermometer, this can be easily resolved and shouldn’t put you off purchasing what is a brilliant product at the price point. I would definitely give this a 4 out of 5, which is very impressive considering the fact that this can be picked up for a very affordable price on amazon at the moment!